The variety of different high quality gadgets have become a ubiquitous part of our lifestyles. When there are two similar types of gadgets, conflict over dominance over the market is bound to rise. 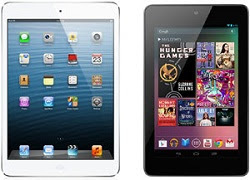 Google’s Nexus7 and iPad Mini of Apple are examples of two giants at loggerheads over their latest products. Both of them are extremely advanced and also expensive. A comparison of these tablets might yield some points that might make them different from each other. First of all, it is quite well known that Apple is not fond of any competition in the area of tablets. The normal iPad would not have drawn any comparisons but the size of iPad Mini makes it a contender of Nexus. One might as well say that Apple did the size thing deliberately to put some competition for the Nexus7. Now, let us look at some of the differences and similarities between these two gadgets. The first factor that comes to consumers’ minds when going for a new gadget is the price of the product. The price of Nexus7 is comparatively low, as it was expected. The 16 gigabyte model of the nexus7 asks for 199 pounds; whereas, the same memory unit model of iPad Mini would cost around 269 pounds. The price factor does not seem to bother Apple much. Because, they know that customers who have a fetish for Apple products would spare no expense to get their hands on the product. Apple products are not for thrifty consumers. The next comparison can be based on the sizes and screen dimensions of both the gadgets. It can be safe to say that both the devices are of same weight and height. The Wi-Fi models of the iPad Mini are a bit heavier. Screen size of iPad Mini is almost 8 inches display. On the other hand, the Nexux7 model is one inch short of that size in display. But, still the 7 inches display of that particular gadget provides adequate quality display. The details of the display are better with Nexus7 than with iPad Mini. 216ppi of pixel density gives the nexus model an upper hand over iPad Mini’s pixel density, which is of 163ppi. The Google product is powered by the quad-core Tegra 3 chip of nVidia. Apple, on the other side, uses its own A5 processor which is of dual-core type. So processor wise, Nexus7 might just be a better choice. Nexus7 comes with the variety of two storage models and they are of 16GB and 32 GB. But the iPad Mini has an additional model of 64GB as well as the two storage models used by Nexus7. The camera is a very important factor for all modern gadgets now-a-days. Both of them have 1.2mp front camera, but iPad Mini has an additional rear facing camera of 5 mega pixels. So, it can be seen that both the gadgets have their superiorities and inferiorities. Finally, it goes down to personal preferences on choosing one over the other. About the author: Diana is a blogger by profession. She loves writing, reading and traveling. Beside this she is fond of luxury cars and wishes to own one day Lexus IS 350. Android OR iOS: Which is the best ?